For the first time since the summer, this week in Fantasy Movie League (FML) presents us with our first Friday/Saturday/Sunday/Monday (FSSM) weekend featuring a single holiday that follows a normal Friday/Saturday/Sunday (FSSM). You might recall that Christmas and Hanukkah overlapped with each other for a FSSM weekend a few weeks ago, which was then followed by the rare back-to-back FSSM weekends with New Year’s Day. How is MLK weekend different from others? Are the results of the Golden Globes a big deal? Before we examine that, let’s look at last week and how an often overlooked data source championed by a Skynet member helped me. Data later in the week matters more than data earlier in the week. In this space last week, based on the ProBoxOffice.com Long Range Forecast for “Hidden Figures”, I compared story of NASA legends Katherine Johnson, Dorothy Vaughan, and Mary Jackson to “Selma” but as the week wore on it became clear that it might, instead, be closer to “The Help”. Given that it was already in limited release, we had daily numbers to compare to and if you followed things closely in The Chatter, you probably saw that most people set a bar of a $1M Thursday as an indicator that the film would be headed over $20M despite Thursday returns not counting towards the FSS gross. Sure enough, when it came in at $1.2M for Thursday most lineups turned towards three screens of “Hidden Figures”. That makes me happy, because this is an important story that more people should know about. You might recall that I had similar hopes for “Queen of Katwe” not too long ago that didn’t pan out. That “Hidden Figures” went for more than $20M hopefully sends a message to Hollywood executives that not all movies have to be about cool guys who don’t look at explosions. But what did it for me in advance of the weekend that indicated “Hidden Figures” would do well was another source, one that BSWhite1970 has long advocated, and that’s the Movietickets.com “Trending Now” widget. Thursday night, had you gone to Movietickets.com and scrolled down about half a page, you would have seen that “Trending Now” was reporting that 11% of the movie tickets sold in the prior 24 hours were for “Hidden Figures”. That alone wasn’t terribly interesting, but that “Sing” also sold 11% of movie tickets over that same period told me all I needed to know about “Hidden Figures”. It doesn’t get talked about a lot, but this data source can be an informative one. 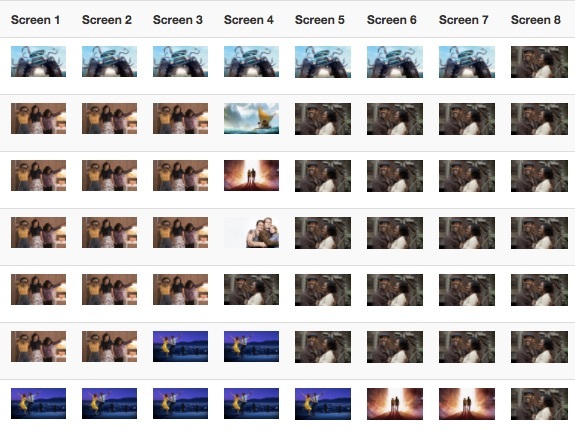 Movies whose titles are in orange were new that week and the following three columns look at how all movies performed for the FSS of MLK weekend (in other words, not counting Monday). That is then followed by the theater count (TC) and the change of TC from the prior week. Then comes FSSM grosses for the full MLK weekend and the FSSM Per Theater Average). Much like I did for Boxing Day, the MLK Day Bump column takes the Monday only gross and divides it by the FSS to give an indicator of how much of an audience saw a particular film on Monday. The final column compares the FSSM of the MLK weekend to the FSS for the prior weekend. What does all this tell us? Not surprisingly, family films and those involving stories centered on African American characters get a bigger bump from Monday of MLK weekend than other movies do. Take a little bit of caution on the latter, though, as “Selma” has a more direct link to the holiday than other films starring and about African Americans have and, therefore, likely saw a larger bump. In 2016, “The Revenant” basically “won” the Golden Globes and saw a very strong hold with a modest TC increase. Other smaller films that didn’t do quite as well with awards still saw some nice returns with TC increases, just like any other weekend. So, results at the Golden Globes don’t necessarily have the impact on the box office as you might think. Simply being part of the conversation can be enough, all things being equal. In support of this, last year in FML, “The Big Short” won Best Performer despite not doing as well as it could have on Golden Globes night. Keep in mind that we are rumored to be seeing an expansion for “La La Land” this week which won’t be confirmed until as late as Thursday. Its FSSM business this weekend will have a lot more to do with that than how it did on Sunday night at The Beverly Hilton. It’s been awhile since we had five new wide releases entering the market (with a limited Scorsese film as well) and we’re sure to see expansions on awards-centric movies as well, so theater counts on the low end choices will be especially important to monitor this week. For the second time in less than six months, we are asked whether or not the public will respond to a film on a topic already covered by an HBO documentary. In September, “Snowden” failed to turn a profit and how much of that had to do with the widely praised “Citizenfour” versus interest in the topic was unclear, but we are met with a similar situation this week with regards to “Patriots Day” and “Marathon: The Patriots Day Bombing”. As an avid HBO NOW subscriber, I’ve seen the latter and it’s incredibly moving, leaving me no incentive to see this movie. How many people fit that description, though? How about “Monster Trucks”? With “Sing” and “Rogue One” still in theaters competing for families, it comes in with a low Rotten Tomatoes score and an unimpressive foreign box office to go with the $125M it cost to make. You’ll see plenty of “Norm of the North” comparisons in the forums based on release timing (which had to go up against “The Force Awakens” and “Alvin and the Chipmunks: The Road Chip”), but this movie may have a chance for that coveted family audience based on the simplicity of its message and the fact that it’s a Nickelodeon film, which will help its marketing for an opening weekend even if word of mouth dampens it after that. The “Sleepless” trailer is interesting except for the fact that Open Road Films didn’t bother to redo the graphics after they moved up the release date. That hints that they didn’t think it would do well in the spring and thought they could cut their losses on a less competitive weekend, relying on the general awesomeness of Jamie Foxx to pull people in. Film award regular Ben Affleck came up empty on nominations this year with “Live By Night”, which expands this week. “The Bye Bye Man” rounds out the new wide releases with what is already our second horror film of 2017. I think the latter has a chance to surprise based on horror fan behavior in general, but I hesitate to think that’s a slam dunk with “Underworld: Blood Wars” still in theaters. “Silence” is a long time passion project for Martin Scorsese and the showtimes report will be worth examining on Thursday to see just how dense its limited release is this weekend but as the lowest price film on out palette this week it is likely at best a low end filler. It’s been a few weeks since we had multiple new films, but per usual on Monday the Lineup Calculator had new movies with ProBoxOffice.com Long Range Forecasts (LRFs) set accordingly and all others defaulted to the average value of those LRFs, $72.84K. From that, it’s clear that the Triple Dog Dare this week is “Monster Trucks”, which fits on seven screens with any number of fillers. CCR set his Bonus Bar much higher than that though, at $100K. His top three contenders are “Hidden Figures”, “Sing”, and “Fences” so if you set the Lineup Calculator for those three to a $100K value, a number of 3x “Hidden Figures” and 4x “Fences” combinations look attractive or even 5x “Fences”. The math doesn’t support using “Sing”, though. If you take CCR’s next tier and do the same for “Monster Trucks” and “The Bye Bye Man”, the “Hidden Figures”/”Fences” combos still show strong. Discount “Hidden Figures” and “Fences”, some “Sing” combinations with an empty screen rise in value but nothing anchored by either of the two newcomers in that “Risk/Upside Plays” tier rears its head. Set both the “Top BP Contenders” and “Risk/Upside Plays” back to $100K value and do the same for “Upper Mid Tier” and a 2x “Hidden Figures”, 2x “La La Land”, 4x “Fences” hedge play reveals itself. Bump “La La Land” to $16M, which is possible given its TC expansion potential, and a 5x “La La Land”, 2x “Passengers”, “Fences” combination is worth watching as well. Needless to say, the numbers to look for throughout the week are the daily values for “Fences”, “Hidden Figures”, and “La La Land” and the deciding factor for the week will likely be how large the TC expansion is for “La La Land”.